Below are charts of country and regional dependency ratios. In theory, the economy does better when the dependency ratio is falling and less well when it is rising. But, as discussed in this previous post, two important mitigating factors are a country’s rate of innovation and its institutional strength. 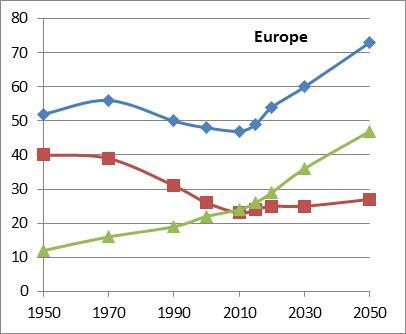 Figure 1 shows the total dependency ratios of Europe, Japan and the US from 1950 to 2050. The ratio bottomed in Japan two decades before it bottomed in Europe and the US, which may explain Japan’s stagnation relative to the US and Europe in the 1990-2008 period. 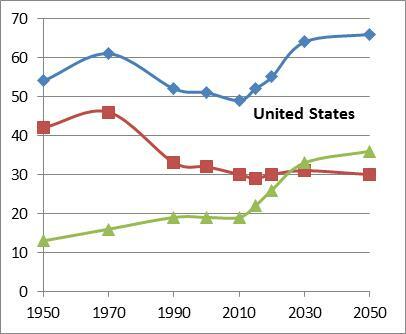 In the 1980s, 1990s and early 2000s, Europe and the US benefited from a declining ratio. All three ratios will rise from now into the foreseeable future. 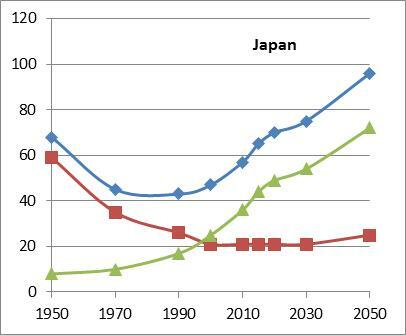 But Japan’s ratio will rise faster due to its older population. 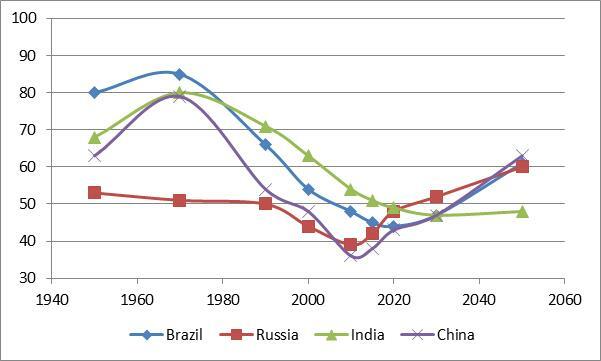 Figure 2 shows the total dependency ratios of the BRIC countries: Brazil, Russia, India and China. 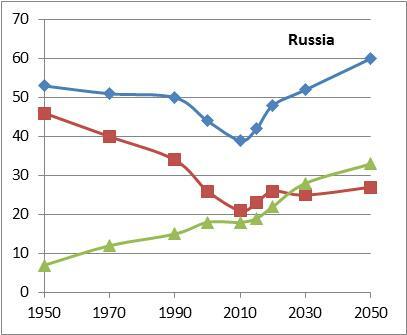 The ratios of Russia and China are both bottoming in the middle of the present decade and will rise for the foreseeable future. 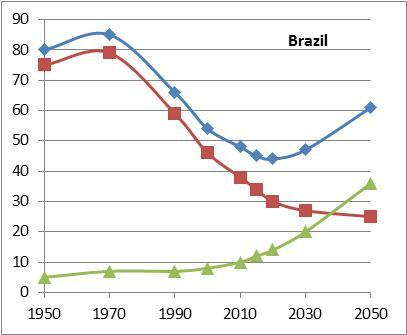 Brazil’s ratio will bottom later this decade and will subsequently rise. India’s ratio will continue to fall until about 2030 and will level off until 2050, which may help its economy grow faster. Following are charts for a few individual countries and for Europe and Africa, showing all three dependency ratios as defined above. The blue line is the total ratio, the red is the child ratio and the green is the old-age ratio. In the case of the US, Europe, Japan and China, it is clear that the rise in the total dependency ratio is mainly driven by a rising old-age ratio. 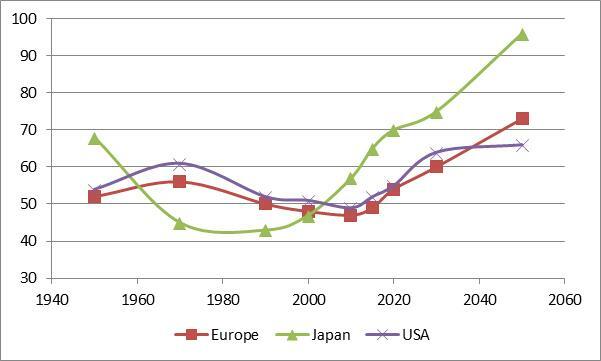 Japan has the fastest rising old-age ratio. None of these countries is expected to see a big rise in its child ratio. 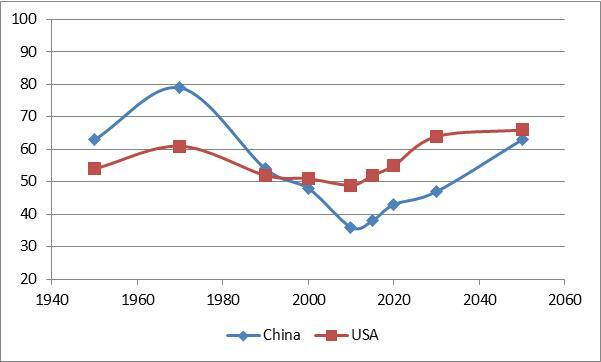 Note the steep 40+ point decline in China’s total dependency and child dependency ratios between 1970-2010. It is due to the country’s one-child policy and it provided a big boost to the Chinese economy in recent decades. 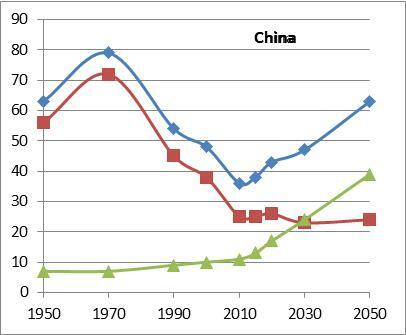 The following chart compares the total dependency ratios of the US and China. China’s ratio fell faster and will also climb faster. 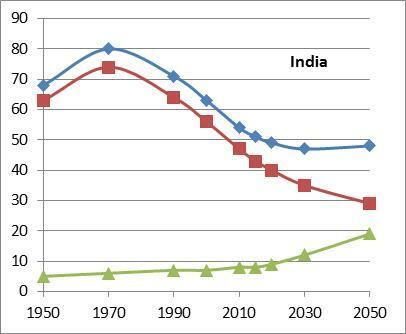 India and Sub-Saharan Africa have a more promising demographic profile. A declining total ratio could markedly improve their economies, if other obstacles can be overcome. 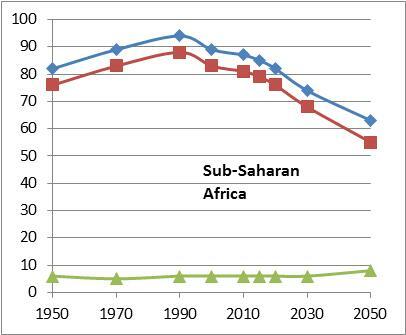 In addition, unlike other regions, Sub-Saharan Africa will not have a rising old-age ratio for the foreseeable future.